Please see our Design service section for further information. InStil Design does not directly install the bathrooms we design, but we are happy to make recommendations and pass on contact details for installers we have dealt with over many years. We do not have any formal commercial relationship with these installers, and so we are not able to offer any additional guarantees to any they may offer to you directly, but continually monitor the quality of the installers' workmanship. What is the warranty on my goods? InStil Design provides a 12 month warranty from the date of delivery for the products we supply. Most of our suppliers provide a longer product warranty. Are you familiar with steam rooms? Yes we are, we have designed and supplied several steam rooms and have the supplier chain to supply all products required. 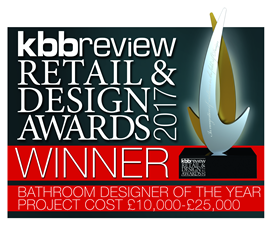 In 2017 Martina won the kbb Bathroom Designer of the year award with her bespoke steam room design for projects between £10k-£25k. Her design was selected from bathroom installations across the UK and Southern Ireland, as examples of excellence in Bathroom design. Why are there no prices on the main website? We do not include prices on our website as more often than not we sell a number of products together to make up a complete bathroom. This means that the overall price will reflect a number of different products, more than often selected from different collections. Prices start from around £2,000 for a cloakroom to over £25,000 for a large bathroom. If you would like a price for an individual product that you have seen on our website, please call 01865 368810 to discuss. Why can I not buy your products online? Most products we sell require some specialist planning or installation and some products need to be combined with others in order to function properly. Therefore most of our products require a site inspection before we can recommend them or guarantee that they are suitable. "InStil are excellent listeners and creative thinkers - a great design service. The installation went seamlessly and the results are fabulous". "1st Class Service from start to finish would highly recommend". "You have transformed our downstairs cloakroom into a beautiful room". InStil Design is based in Oxford, Oxfordshire but also provides a personal bathroom design service in Abingdon, Newbury and Henley-on-Thames.